Welcome to Lake Sterling, elev. 6987 ft. The cache is a small ammo can placed at the parking area. Note: There are vault toilets above campsites 1 & 2. No running water. Glacier Lakes Basin Trails map available in the picture gallery at the bottom of the cache page. From here you have access to the various Glacier Lakes Basin trails and caches. I will also use this cache page as a home page for all those caches with detailed driving directions, trail descriptions and condition updates via log notes when available. Please contribute! This will avoid loading every cache page with all the detailed info. Why this place? As a Boy Scout I spent my summers at the nearby scout camp, canoeing on this lake and hiking the trails North of the lake. Now I bring the family up every year for camping and what my children started referring to as the “Death March” all day hike around the trails. This is the high Sierra. Winters are harsh and can extend well into what many of us consider Spring. In 2014, the roads were clear in mid May, which was early. A few years ago the scout camp staff had to ski over 6 foot drifts on July 4th and camp was cancelled until mid Aug. July 1st is “typical”. Late rains are a problem. If there are puddles in the road then the trails will be wet. Use these cache logs for updates. Getting here can be it’s own adventure, but what a beautiful destination. The road condition varies from year to year but is always bad. This is not a drive for the squeamish. The road is marked as 4WD recommended, but the 4 powered wheels is the only part of “4x” that you do not need. You WILL need some basic pick-up level of clearance. I have a small stock 2WD pickup, Toyota Tacoma, with standard clearance. According to the manual my 15” road tires give me 7” of clearance and I would consider this a minimum. I have not had a problem as long as I was paying attention and picking my route well. The big danger is that you have to dodge the tire biters (rocks). Big rocks and lots of them. I wish that I had some 6-ply sidewalls. As far as traction: I am always loaded with camping gear and never had an issue. Your destination is 6 miles from Cisco Grove on I-80, figure on 45 minutes. From the freeway exit at Cisco Grove go North to the T, Hampshire Rocks Road and turn left. Just before you reach the gated entry into the Cisco Grove RV Park right on Fordyce Road (Rattle Snake Rd). Follow the signs to Lake Sterling and Camp Cole (BSA) (GTSR). Once you pass the RV Park the next mile of road is rough. 2015: Past the Woodchuck organizational camp is one mile of yuck. If you can make that mile the rest will be easy. Just as you are reaching the scout camp and Lake Sterling the road may seem to disappear. Stay to the right over the rock and you will quickly see road again. You will pass the Scout camp (organizational campground) and drop down to the PGE Lake Sterling campground. Parking and this cache are at the end. 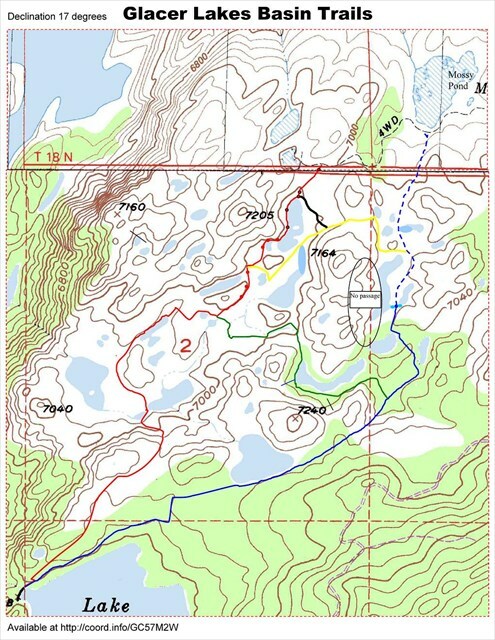 Note that maps will show a 4WD trail going to Mossy Pond. This path can be very hard-core. Enjoy the hike from Sterling. Finally, you made it. Grab the cache and go for a hike. These hiking-only trails wind out though a beautiful square mile+ area of glacial rock and ponds NE of Lake Sterling and according to the only remaining original trail sign are called the Glacier Lakes Basin Trails. How early or late in the year to come up here is always a big question. Much of the trail system follows watercourses and rain puddles as well as crossing many marsh areas. Hiking right after a storm can result in a wet experience and the need to blaze alternate routes around water. But generally once the road is open and dry you are good to go. I will post the collected updates to this Lake Sterling cache log and please post your own notes. To access the trails from the parking area, start down toward the campsites and lake, and then turn left/north onto the trail continuing to the dam. Trail marking in this section has not been lasting year to year. I’ll work on that. Cross the dam, veer right around the helipad. Soon you should see the trail (red and blue). There seems to some muggling of the markings in the vicinity of the dam. The trails have a mix of markings, flags, ribbons, and old paint on rocks. But don’t trust the stacked rocks. The blue trail (or East trail to Mossy Pond) is the easier trail, most popular, and is being kept well marked (thank you to somebody). After the helipad and finding the trail continue straight. Soon you will start seeing markings. This trail does have more marsh area and water crossings that take longer to dry down but most of the path is an easy slope. There are a fair number of downed trees to negotiate. Along the North side of the lake where the lake trail and blue trail divide is not always marked. Stay left (North) for blue at N39 21.593 W120 29.213 (Blue x Lake trail split). There is one water crossing of note. Just north of my Blue Trail Aid Box cache you must walk a narrow log over the water. There are two logs side by side that work for kids but at 220 lbs only one log will support my weight. The logs are at water level, it is short and the water is not deep. The red trail is the lesser traveled and was the favorite when I was a scout. It has been seldom used in recent decades until I started doing maintenance a couple years ago. It was a challenge to find that last of the red paint from the 1970’s. This is the more challenging trail but dries out sooner. Finding the beginning of the red trail from the dam can be tricky. For safety reasons the trail start has been moved and for some reason the marking keeps going away. Stay to the right around the helipad as for the blue trail. Once into the small trees there will be a hard left at N39 21.463 W120 29.523 (Red Trail Split). The old path was to continue straight off the dam and up the steep and slippery hillside. The green trail, #13E01, connects the red and blue trails. 2015: Did some marking and rerouting of the trail. Should be much easier to follow. Yellow or white? There is a path around Lake Sterling. Did we call it yellow or white? Either way I don’t think it was ever marked. Yellow? My map shows a yellow trail connecting the red and blue trails just north of the furthest caches. Update 2014: East and middle are now marked. 2015: West end is mostly marked. If you can use a topo then you can probably find your way with my trail map. My Trail Map is available in the picture gallery. The Red and Blue trails are doable as a day trip from Sacramento for good hikers (as a loop and even adding in Mossy pond). But my preference is camping overnight. Camping is available around the area as well as this PG&E campground at Lake Sterling, a beautiful place to stay and is my preference. There are 5 walk-in sites with picnic tables and fire rings (get your campfire permit). Vault toilets and no water other than the lake, fine for dishwashing. You can be alone on a weekday but the camp does fill up on weekends. Typical open is mid-June. Currently $15 per night. Woodchuck Campground is back down the road. Seems to always have space. Open forest camping is an option but fire restrictions can be challenging. If you have questions please feel free to contact me through my profile page. Congratulations to Shrektrician for the FTF.